These past two weeks have been a never ending cycle of activity and rest for Amber with school lessons thrown in around the rest periods. It's coming towards the end of the school year and even homeschoolers have end-of-year activities, especially after co-op classes are over. 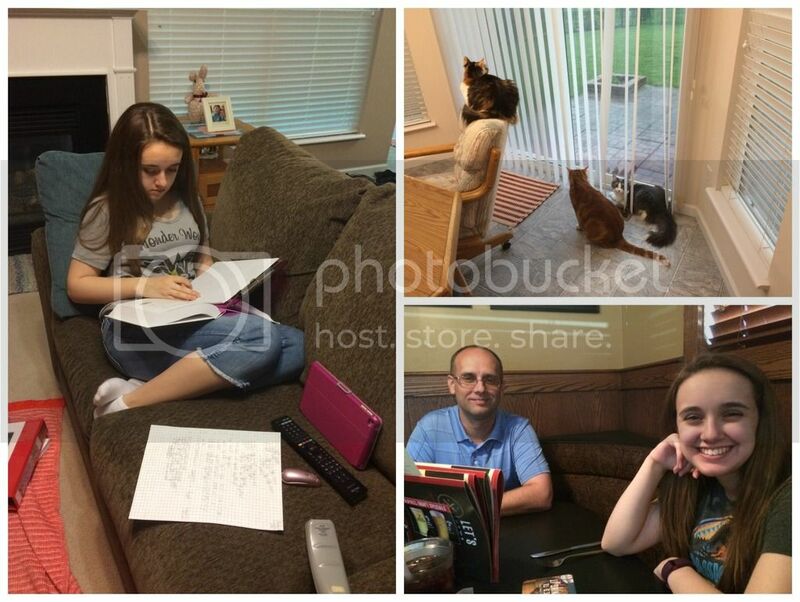 Schoolwork on the couch during a rather nasty storm; cats watching out, very concerned during the same green-sky storm; and a fun weekday lunch with Daddy, just because we were nearby. Last week we had quite a few storms here in Missouri, even some fairly severe ones. Thankfully, there were no tornadoes or damage in our immediate area. However the pressure changes and all the comes with storm systems affect Amber's body because of her malfunctioning autonomic nervous system. Who knew the ANS did so much for you. Anyway, she spent a good deal of last week feeling poorly and trying to continue with her regular lessons, appointments and activities - flute and confirmation are on the same day! 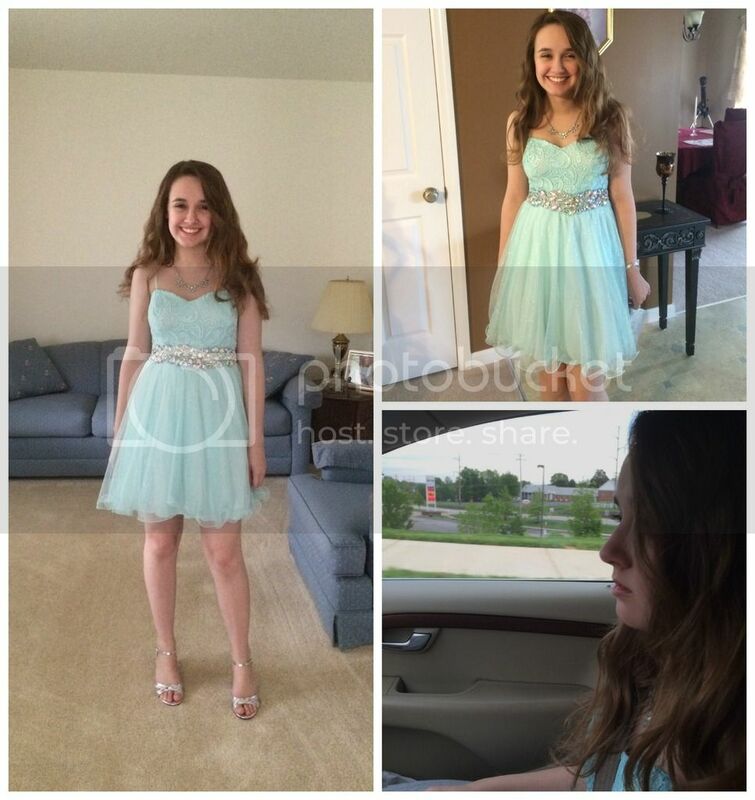 We desperately needed her to rest though because her first ever formal dance was last Friday evening. It was a homeschool prom / formal where those as young as 8th grade were invited to attend. 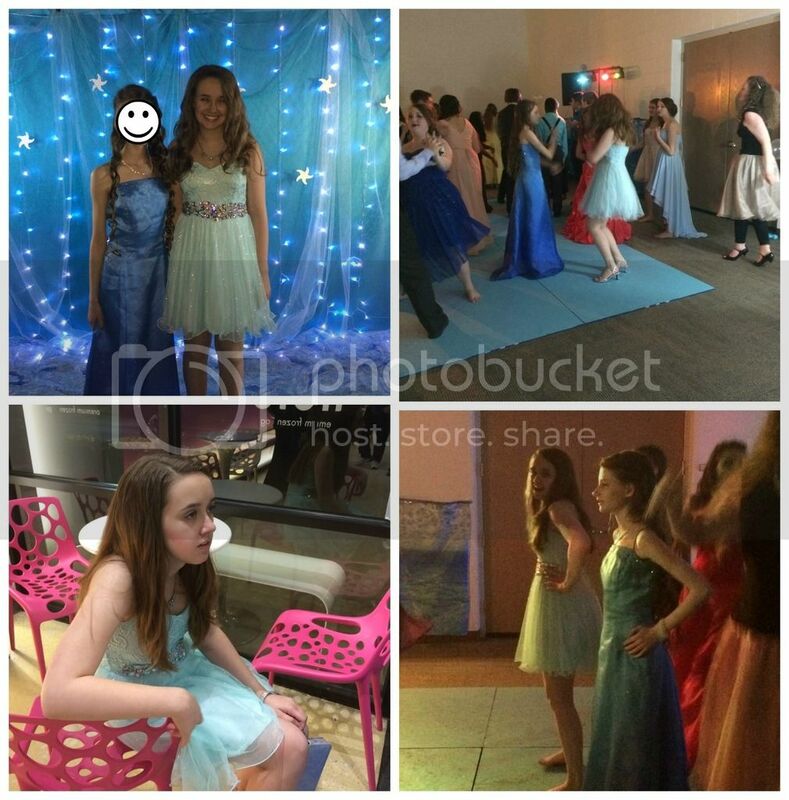 Amber had been looking forward to this dance for months and was attending with many friends. Prior to the dance. Pictures at our house, pictures at Grandma's house, and nervous /excited in the car. Thankfully Amber was rested enough to make it through all but the last hour of the dance and enjoyed herself immensely. We left a bit early with some of her friends to stop for Froyo before heading home. Amber was very sore and exhausted even before she got home that evening, yet we all believe it was worth the effort. Saturday, the day after the dance, she wasn't as sick as we expected, but continued to spiral downward each day afterwards until she hit bottom on Tuesday of this week. It was even a wheelchair day if she wanted to get out because her heart couldn't handle anything at all. Another round of storms didn't help much either. Dancing, Macarena, and exhausted at Froyo. Wednesday of this week Amber seemed to be climbing back up out of her dance induced dysautonomia / EDS flare. She was able to go out and about in limited bursts without a wheelchair, attend her flute lesson, and her LAST Wednesday night confirmation class at church. Thursday Amber wasn't much improved from Wednesday, but she hadn't regressed either. 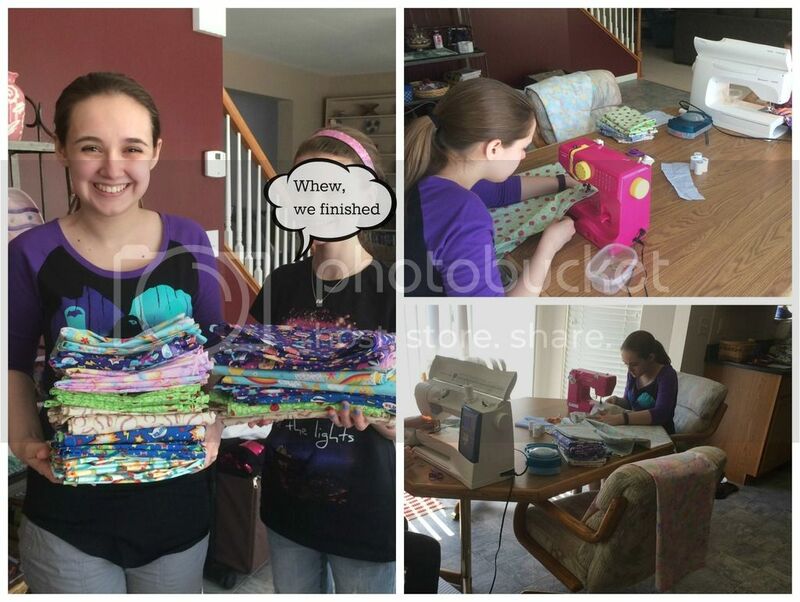 A friend of Amber's and her mom came over on Thursday afternoon to sew pillowcases for Children's Hospital as the girls' confirmation service hours. By the end of the afternoon the girls had 22 pillowcases (plus my sample) and their service hours for the module are complete. Amber opted to use her small, one-speed sewing machine instead of mine. Her friend used her mom's machine. Today we met up with many friends from the homeschool group for an end-of-year picnic. Amber really wasn't healthy enough for all the activity, but we went anyway so she could calmly hang out with her friends. It might have caused another regression, but again Amber thinks it was worth the effort. And honestly, because it doesn't cause long-term health problems we think the benefits of the dance and the picnic today are worth the short-term sickness. School wise, Amber is *almost* finished with all of her required hours, but has not completed all that I consider to be 8th grade. She'll make it by the end of the school year though and I am not even remotely concerned. These last two weeks Amber has been rather dedicated to her math, so much so that she has completed quite a few extra assignments. I even let her skip out on the writing which she is normally so eager to complete in order to continue working on math. I'll take it when I can get it from her. Chalk drawing with friends during the picnic. Book reading and resting afterwards. Much resting. Logic, writing, literature, and history were all well represented these last two weeks with significant progress in each subject. Again, no science. Sigh. Amber just can't bring herself to work through it. She says it's not the curriculum, yet I'm not convinced. I know she doesn't dislike the physical science curriculum, but I'm wondering if it just isn't a good match for her learning style. 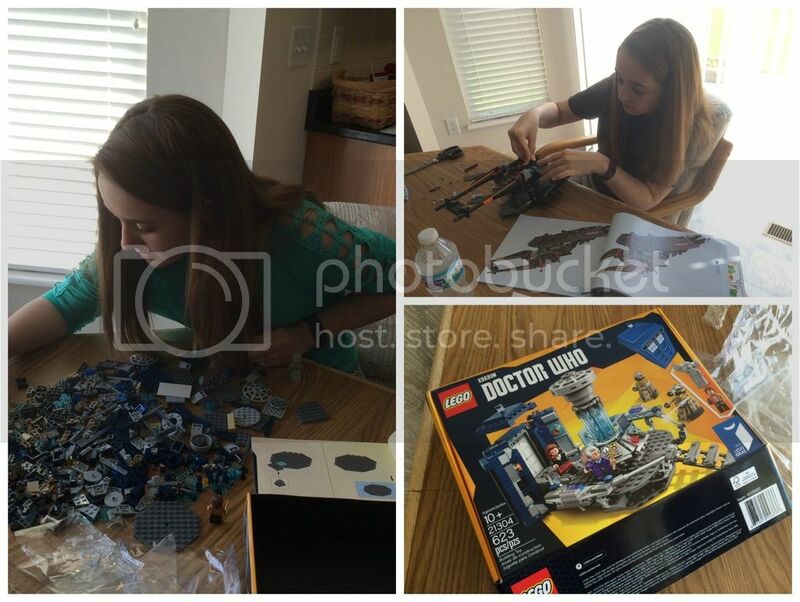 In addition to all the social activities, school work, medical appointments, flute lessons & practices, confirmation classes and homework, and resting, Amber has acquired and built a couple more LEGO sets: one rather large Ninjago set, and a LEGO Ideas Doctor Who Tardis set. Of course there has been Doctor Who watching a few evenings a week too - we should be finishing the 4th season tonight! She's also read two or three (I've lost count) new novels. 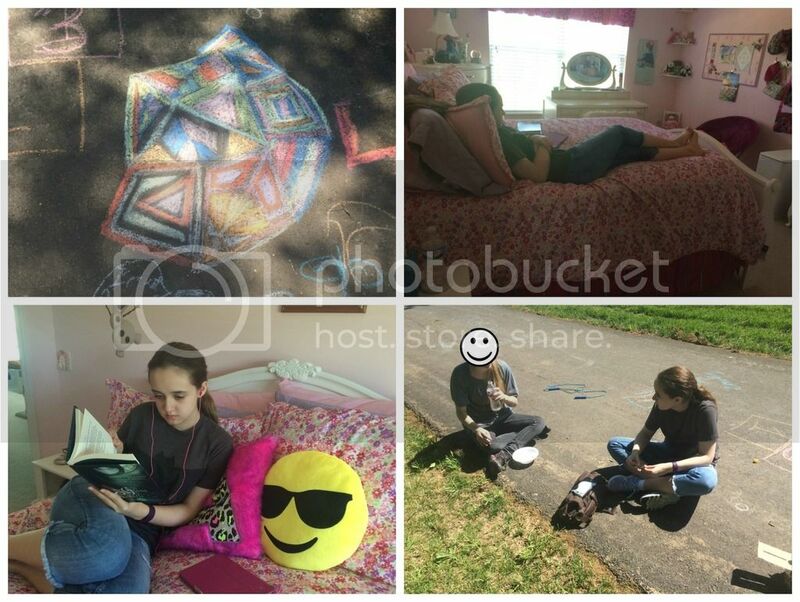 I pre-order books for the child on Amazon, they arrive via UPS, she takes the package away, and reads while resting. There was a lot of resting these past two weeks. This weekend we are going to let Amber recover more and have a couple of low-key Mother's Day celebrations: first with my mom on Saturday and then just the three of us on Sunday. It will be nice to do nothing in particular for a day or two. Next week, Amber has four medical appointments scheduled plus she may possibly attend the middle school night at church for a service project. It's not a required project for confirmation and I'm just not sure if she will feel up to it that late in the day. I am ready for the year to be over. The kids are not having health issues, but there are just so many events for my sensory prone boy to get through. I know what you mean about it being worth the effort. I am glad Amber got out to do so many fun things. I just LOVE her dress --- so pretty! And congratulations on Amber's confirmation. That happened at our church last week, too. Thanks for linking, Christy! Congratulations are a bit premature - give us 5 months. Our congregation adopted a new and alternate confirmation schedule last year, making Amber's grade the second group to go through it. While she has now finished all of her Wednesday evening confirmation classes and all of the catechismal work, she won't be confirmed until Reformation Sunday this year. The confirmands have one more "module" in early 9th grade to help them continue to live their faith in our world and society. From what I understand of last year's class, it is more of a Bible study / discussion than the previous catechism based modules. Amber did have her first communion on Maundy Thursday of this year, and is considered a communicant member in good standing of the Lutheran Church - Missouri Synod. She's just in a flux state until Reformation Sunday with her formal confirmation. I think even kids without illness would have found Amber's activities tiring this week. But it all sounds like it was well worth it and she sure looks like she was having lots of fun. I'll second what Mother of 3 said!!! Amber looks stunning in her prom dress! I'm glad she was able to attend so many social events this week! That's so sweet of her to sew pillowcases. Bethany received a cute pillowcase during one of her hospital stays years ago! She still loves it and refuses to use any other pillow case! I have no idea what I'm going to do when it's too worn out to use! Happy Mother's Day Christy!